Suggested Use: 1 to 3 capsules daily in divided doses or as directed by a health care professional. Idebenone: If you’re already smart, take this and stay smart. Otherwise, you’ll stay dumb without it. protecting the body from low-oxygen levels (that occur in heart attacks or strokes). This is why many people supplement with both idebenone and CoQ10. deficiencies in serotonin, dopamine, and other neurotransmitters needed for proper nerve function. 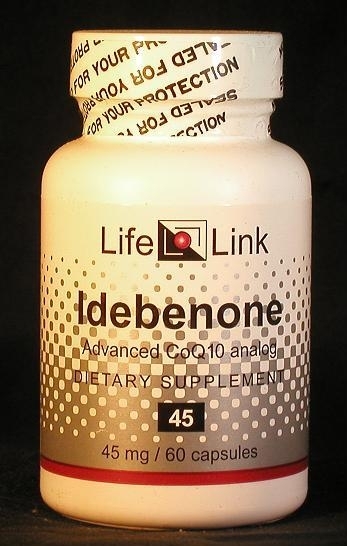 Idebenone, unlike CoQ10, cannot be made by the human body; unless you use it as a supplement, you’ll miss out. Coenzyme Q10 (CoQ10) plays a crucial role in human metabolism and health. Decades of CoQ10 research has led to idebenone, a CoQ10 variant with different, but complementary, benefits. CoQ10 appears to be more beneficial for heart disease and cancer (see our CoQ10: for Heart Disease, Cancer, and Statins flyer), and for treating illness and antiaging (see our CoQ10: Anti-Aging and Pro-Health flyer.) Idebenone seems to work better at improving cognition, treating brain disorders, and protecting the body from low-oxygen levels. This is why many people supplement with both idebenone and CoQ10. Idebenone crosses the blood-brain barrier, allowing it to protect the brain and improve its metabolism. By stimulating Nerve Growth Factor (NGF), a key player in neuron health that must be produced in the brain, idebenone can counteract the effects of aging and help reduce the damage from brain disorders like Alzheimer’s, Parkinson’s, and Huntington’s Disease, and Friedreich’s Ataxia. It also boosts serotonin, dopamine, and neurotransmitter levels and improves nerve function. Equally important is idebenone’s role as a neuroprotector. Many drugs, both licit and illicit, produce excitotoxins that can impair or damage the brain, as can processed-food additives like monosodium glutamate (MSG) — including camouflaged MSG such as hydrolyzed vegetable protein, yeast extract, and soy protein compounds — and aspartame (Nutrasweet). Idebenone shields the brain against the degrading effects of these compounds, and, in general, protects organs against damage. A potent antioxidant, idebenone is superior to CoQ10 as free-radical scavenger, and is eight times more potent than aspirin as a blood-clot inhibitor. At the cellular level, it protects against mitochondria damage, increasing energy while decreasing toxic by-products. At the organ level, it reduces or eliminates toxins, both from diet and from the metabolism of pharmaceuticals and over-the-counter drugs. (Lipoic acid and n-acetyl-cysteine have closely-related benefits; see our flyers for details.) The difference between idebenone and CoQ10 really comes into focus, however, when the body’s oxygen levels drop. Low-oxygen conditions — such as those during a heart attack, stroke, or surgery — can cause a situation where CoQ10 may stop acting as an antioxidant and, instead, start producing free radicals. Idebenone, however, continues to function in low-oxygen environments, preventing damage when the body is most vulnerable. Superior low-oxygen performance is why idebenone is used to safeguard organs during transplants. The discovery of the benefits of CoQ10 was a milestone in human health. Idebenone promises to deliver equally impressive results. Unlike CoQ10, however, your body cannot make idebenone; unless you supplement, you’re clearly missing out.